Boy Showing Off Badges, this Norman Rockwell painting, appeared on the cover of The Literary Digest published August 17, 1918. This was Rockwell's first cover illustration for The Literary Digest. After this cover, The Literary Digest went on to feature Rockwell artwork on its cover forty-six more times through 1923. The last Rockwell Literary Digest cover was The Night Before Christmas. This illustration is reproduced on page 47 of Norman Rockwell, A Definitive Catalogue by Laurie Norton Moffatt. Norman Rockwell painted three covers for the magazine in 1918. All three were related to World War I. This illustration shows a young boy showing the badges he earned doing his part to help the war effort. 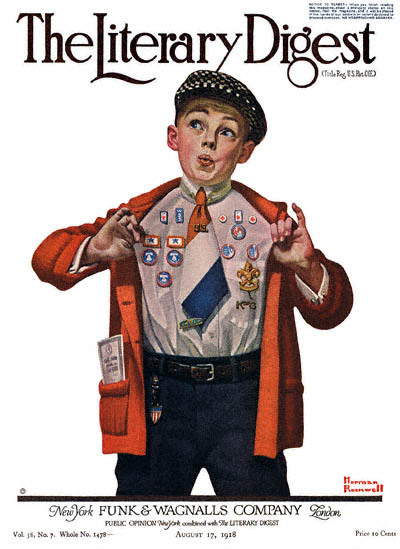 Boy Showing Off Badges was only one of 47 Norman Rockwell Literary Digest covers; here is the list of more Norman Rockwell Literary Digest scans. He is very proud and whistling to show his happiness. The boy is also showing his patriotism by wearing his red sweater and red, white and blue necktie. We can also notice that his necktie is held down with two tie tacks. One looks like it might be one of his medals. It is yellow, possibly gold with two gold stars on a field of blue on each side. The other tie tack is more of a pin. The boy wears it higher up. The pin says "U.S." in gold. We can also see his commendation in the pocket of his sweater. My how I would love to know what it says. The boy is also wearing a shirt with French cuffs at the end of the sleeves. He sports cuff links to keep those cuffs buttoned. Surely, as decked out as he apparently is, sporting a commendation in his pocket, this scene must be from a commendation ceremony. No wonder this boy is showing off. Norman Rockwell especially loved painting children. His enthusiasm for the subject really shines in this painting.